A lot of companies are entering the business with a variety of products and services. All of them require different websites for different kinds of business modules. Website design can play a very vital role in differentiating one from its competitors. 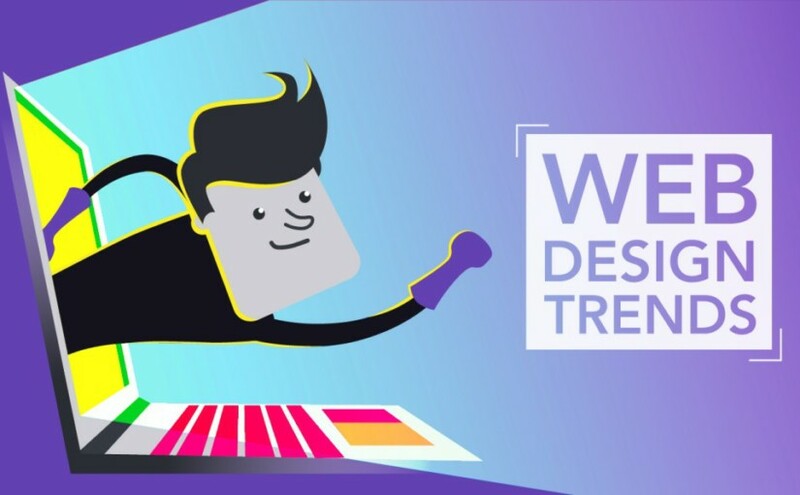 So the use of visual design tips and trends are essential. You need to follow some specific design tips and trends. For example, people prefer images over plaintexts. In all social media platforms, visuals engage and attract more users. So, it is one of the marketing strategies you would like to follow. These design elements are not constant. They are prone to change and run out of trend. To be competitive, one needs to adapt to the ongoing design trends. An outdated website can never bring the expected results. It is 2018, and you have to think of new design tips and trends for this year. If you are still carrying on with what you did in 2017 or earlier, you are losing the race. Use of beautiful, vibrant colors attracts users and increases traffic to your site. As traffic increases, so does your conversion rate. with your colors, and if you have a less exciting site, you should have the courage to bring some changes with colors. Bold colors have been one of the most common driving forces of this year. But make sure you are also consistent in using colors throughout the site. Fonts play a vital role in design. Different fonts have different effects on people just like color schemes. Don’t overlook the importance of typography. It is one of the top design trends in 2018 and for the coming years. Use of appropriate and robust visual fonts help draw the attention of the visitors to specific content. Nowadays it is the bigger, the better. Designers opt for artistic effects, extra-large font sizes, and huge headlines. You can add some eye-catching handwritten fonts. This is an ongoing trend that has come from the design world moving away from boring minimalism. It is probably going to make you stand out from your competitors. To produce something on printed material for professional business purposes, go for a classic serif font. For a posh feeling, opt for a thin and long sans serif font. You can also add color fonts and animated typography. Such diversities can undoubtedly upgrade your presentation that can be achieved through the correct use of fonts. So it would be a poor choice not to give it a thought. Consider videos as an integral part of the design elements for your site. They are becoming popular and have already become a reliable marketing tool too. Creating videos is not that expensive nowadays. You can take help from creative agencies for getting the right type of videos to go with your site. For example, if you are a fashion design company in New York, your videos should follow the fashion trends in the US market. They should be polished and glamorous while displaying your product range. On the other hand, if you are a web design agency, your videos should most probably contain client testimonials. They should look authentic and professional. Placing the video on your site in the right way is also essential. Here’s an example from WebAlive, a web design agency in Melbourne. They use a proper combination of text and video to visually present their client testimonials. Use of images is another design tool that you must use in your website. Use of large images is a new trend which is adopted by many modern websites. As the amount of contents created each year is rising, the need for quality images has increased too. As a result, some pictures are being overused. If you see a picture for the hundredth time, would you go through the content? I guess, no. Authentic photography looks and feels real. I guess everyone in your group has a smartphone with a decent camera now. Use it. Or contact a photographer if needed. Keep it real. It helps. Who doesn’t love a gif? Everybody does. In case you are having trouble adding videos and images, you may try GIFs. They are even better if used in the right way. They add versatility. They do not require any special software to run and can be embedded just about anywhere. They are small in size too. GIFs work as a perfect little conversation that expresses emotion when texts don’t. Instead of using stock images, try creating a GIF investing a few minutes. It has been observed that tweeter tweets with GIFs are two times more likely to be retweeted than tweets with photos. Cinemagraphs are images that are completely frozen except for a tiny area of subtle movement. They are more like cousins of GIFs. In 2018 Cinemagraphs can be a great tool to distinguish yourself from others rather than using traditional GIFs. Because of their subtle movement, they are more eye-catching. The designers are moving towards custom icons and illustrations. Custom graphics not only make content visually attractive but also makes them look authentic. This naturally brings a good feeling about the content. And creates a first impression that is good for the business. Being unique in your presentation is a great way to set you apart from others. If you offer your viewers something entirely different, they will come back to you. As people strive for authenticity in their digital life now, this is quite important. 1. Use bold colors to attract users. 2. Typography is going to play an important role. 3. Use videos and authentic images. 4. Take help of GIFs and cinemagraphs to drive engagements. 5. If possible, use custom illustrations that no doubt gives you appealing visuals and authenticity. Hopefully, all these visual design tips are going to give you a kick start in the right direction if you can use them well.